A top rated Florida law firm that has successfully negotiated over 3000 loan modifications, Amerihope Alliance is going a step further. Responding to unscrupulous lending practices defrauding thousands of Florida homeowners, Amerihope Alliance is fighting back with a mass joinder lawsuit on behalf of its clients. This mass joinder lawsuit is the rallying of frustrated homeowners in legal action against major mortgage lenders. The litigation headed by Lee Friedland and Amerihope Alliance comes in response to the major lenders’ widespread refusal to cooperate with federal modification programs, including their trial payment scams, deceptive forbearance plans, and unjust foreclosure filings. Amerihope’s lawsuit gives individual homeowners a cost-conservative way to hire top legal representation, protect themselves against unfair lending practices and take legal steps to fight back. A joinder lawsuit differs from the more commonly known class action law suits in that each individual homeowner’s case is represented. In this mass joinder a settlement offer is prepared and submitted to the bank on behalf of each plaintiff with regard to their specific case. Settlements can range from a fair loan modification to punitive damages for duress caused by banks unfair and deceptive practices. The initial Amerihope filing against Bank Of America will be swiftly followed by similar action against others including Chase, GMAC, and Wells Fargo. The goal of this joinder suit is to force the hand of justice against lenders guilty of fraud to achieve individual settlements for homeowners that will prevent foreclosure, facilitate loan modifications, achieve principal reductions and most importantly stop the illegal sale of plaintiffs’ homes. In recent years, banks acted lawlessly. Amerihope Alliance Legal Services, partnering with Friedland & Associates, P.A., for this mass joinder suit is turning the tables on deceptive mortgage practices. Our lead attorney Greg Nordt says, “It’s important to note, we’re in this for the long haul. A lawsuit of this nature will not end quickly; the outcome is uncertain. 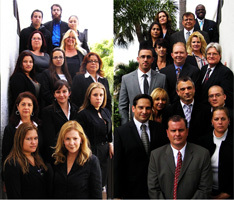 Our firm is providing foreclosure defense to our clients throughout litigation. Homeowners will have confidence knowing our firm takes all steps to protect what was once their most valuable asset.” Amerihope Alliance Legal Services provides free consultations to all Florida homeowners.